After spending much of his adult life on the road as the driving force behind his bands Honeytribe and Royal Southern Brotherhood, Devon Allman is finally taking a moment to step back and reflect on it all. 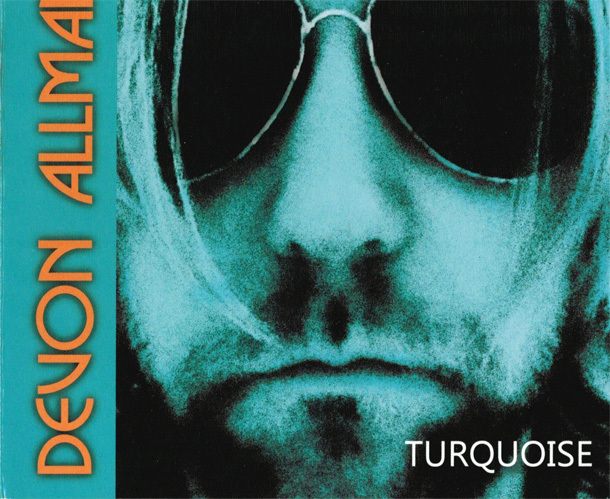 The result is Turquoise, Allman’s first solo album mixed by the Grammy award-winning producer Jim Gaines that doubles as an autobiographical narrative put to music. Don’t be fooled by the playful riffs and rhyming lyrics: Turquoise is as serious as it gets, a glimpse into this musician’s concerns and guilty pleasures. It’s a treat that we all get to bop our heads to experimental blues and learn a bit about the man behind the music at the same time. Though Turquoise’s most noteworthy track “Time Machine” does not open the album, the imagery woven into this particular song functions as the underlying theme for the entire record. Over the slight echo of a steady drumbeat and the careful picking of a guitar, Allman invites his listeners to join him in revisiting some of the standout moments of his life and career, and that’s exactly what Allman uses the rest of the album to do. From the album opener “When I Left Home” through the closing track “Turn Off the World,” Turquoise explores the 20-year journey of one of rock’s most dedicated progenies, striking off on his own to create music outside of his father Gregg Allman’s towering shadow. By the end of the tour, listeners get the sense that despite his independence, the younger Allman’s musical chops are difficult to shake. For all of the experimentation Allman mixes into the album (a bit of tropical reverb on “Key Lime Pie,” some Latin rhythms on “There’s No Time”), it’s when he dives into the blues that his skills really come through. “Time Machine” and “Strategy” both embody a distinct blues tone with grooves worthy of some serious foot tapping, while “Yadira’s Lullaby” gives acoustic lovers something new to add to their playlist of favorites. Neither flashy nor decadent, Turquoise presents a type of everyday blues that listeners will easily relate to. It tells stories, explores musical genres, and crafts a multimedia narrative that is all Allman’s own. Find your iPod and dig out your headphones – Devon Allman’s time machine is about to take off.